No matter how you pronounce them, ScAWn or ScOHne or Scoooon (after the Coronation Stone), these are delicious. 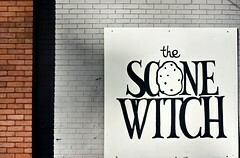 In Ottawa, we have a wonderful little take-out restaurant called The Scone Witch where they make “sconewitches” using scones shaped into squares. You can get sconewitches such as goat cheese and tomato, ham and Gruyère, and poached salmon and cucumber. They serve a variety of different sweet scones too, such as Ginger-Currant, Lemon-Poppyseed, Oatmeal, Orange-Cranberry, and Vanilla-Cream. 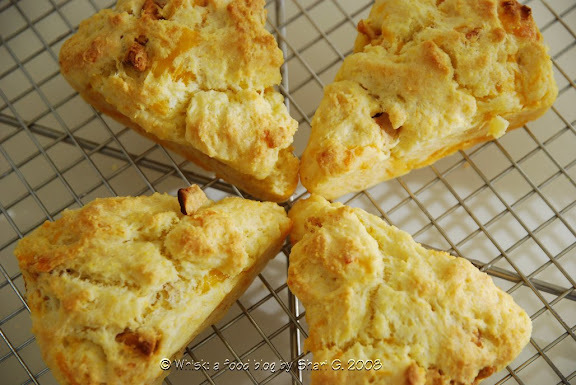 Dorie's apple cheddar scones would be delicious as a sconewitch with ham. Biscuits and scones are both leavened with baking soda or baking powder. Scones are often sweeter and have cream or buttermilk, making it richer. Scones are usually triangular while biscuits are circular. There are more differences listed here. Scones "are made in a manner similar to biscuits and, in fact, share biscuits' buttery-layered texture, but their name, their shape, and the fact that they're served with tea rather than gravy, lift them to the level of fancier fare." The secret to light scones is wet batter. The stickier, the better. Don’t handle them too much, and they will be light and tasty. You can find the recipe for Apple Cheddar Scones in the book Baking: From My Home to Yours by Dorie Greenspan. To see how the rest of the TWD group fared with this week's recipe, click here and then click on each blogger! Thanks to Karina of The Floured Apron who chose the recipe for this week. These scones were wonderful—light, fluffy buttery, and delicious. One of my daughters, who eats grilled cheese sandwiches every single day of the school year and sometimes asks for it on weekends (! ), loved these scones. Double Crusted Blueberry Pie on pages 361-363 chosen by Amy of South in Your Mouth. sconewiches? Oh yeah! I'll take me one of those! Great job! Your scones look great! Beautiful scones! I love your pics. I saw your Danish bread earlier this week and I can't believe I didn't notice the crossword puzzle in the pic. I'm a puzzle addict. Food and a puzzle are the best pleasures the world can offer! A sconewich! I love it! And yours look absolutely perfect! your scones look great! how do you get them in the triangular shape when the batter is so wet? i saw a scone pan at williams-sonoma, but i thought it was just a shortcut type of thing. Wow- they look absolutely perfect! I knew it! I knew it! Shari!!! ...but I'm sure you're not only a scone witch! Great scones... as usual you succeed very well at everything you do! Sconewitches sound fabulous. And yours look yummy! What a freaking great idea! I was gonna toss these, but eaten as a sandwich - well, that will work!! I am thinking those Sconewitches sound quite nice...what a great idea and one that may need trying out soon...like maybe another scone weekend coming up as there are lots of people around for the holidays to help eat them up quickly. You are as always, most inspiring in your posts, photos, ideas, creativity, and I am so happy you kept crashing my computer so I had the chance to meet you! Great job on the scones. Scone witch with ham? I totally agree - a wonderful breakfast sandwich idea. yummy buttery flakiness!!! i think mine were not quite as flaky as they coulda been but still yummy. fab pics!! Wow I would have never thought of having a sconewich, but I like biscuit sandwiches so that could work;) great job! Your scones look great! I love the idea of a ham sandwich with them. I still have 4 left. Hmmm, guess what we're having for dinner tomorrow? Neat post. Pretty pictures. Yay. They look beautiful on the cooling rack! Your scones look great- they have a perfect scone shape! The scone sandwich sounds delicious. I'm intrigued by the combination of cheese and apples - these are delectable, Shari! They look great. I like the idea of making scone-witches. I like Ottawa very much, my son is thinking of going to school there. Thanks everyone for stopping by and taking the time to comment! kim - I happen to have a scone pan (probably like the one you saw at williams-sonoma). It was the first time I`d used it, and I highly recommend it, especially for such a sticky batter as this one was! The pan crisps up the sides too since it`s divided. I`ve included a link to one at amazon in the post now. vibi - Don`t you just love the name of that little take-out restaurant! It`s brilliant. kayte - I`m glad you didn`t give up on me given that I caused such trouble for you and your computer!! sara - I`m sure you can catch up. It`s going to take us 5 years (!) to get through this Baking book!! natashya - Ottawa is a beautiful city. Small enough that you can get anywhere without too much trouble but big enough to have some great shows, museums, restaurants, etc. Those scones look delicious! Very flavorful! your scones look nice and golden and delicious! i couldn't get mine into that nice triangular shape, it was too sticky! oh my goodness...this is the posting i was waiting for, and they sound so delicious...cheese + apples...what could be better! :) lovely photos...can't wait to make these! happy 4th + thanks for the comment about my salted peanut butter cookies! so addicting, i had to give them away! Those look beautiful! I love the first photo. Yum! mmm i was just talking about scones with my friends over dinner today! this combination sounds so very good!!! Your scones look perfect! Next time I'll pat them out too. Thanks for sharing. I love scones and love to see other's input on their scone adventures!